As I sat down to write about a Healthy Heart, I struggled a bit with where to begin, as there is so much contradictory information out there. This can certainly leave you feeling a bit confused and maybe even overwhelmed. There are theories that tout adding a spoonful, or two of coconut oil to smoothies and those who say stay away from saturated fats all together. There are diet regimes that suggest eating lots of animal protein and no grains and those who say animal protein is a bad thing for the heart and to consume more vegetables. Believe it or not, nutrition is still a fledgling science and it is ever evolving as the latest research points us in a new direction. Having studied integrative nutrition for many years, I consistently see that all the experts agree on consuming more leafy greens and seasonal veggies; reducing or eliminating sugar from your daily diet; avoiding overly processed pre-packaged foods and preparing more whole foods at home; and to stop being a couch potato and to keep your body moving. I agree with the experts, but will add my two cents below. As always, before starting any new diet or lifestyle change, be sure to consult with your doctor. In previous columns I have alluded to overall inflammation in the body and how to reduce it and without sounding like a broken record, this is critical for a healthy heart. I believe it begins with a healthy, loving attitude towards life, which includes reducing day to day stress; to stop worrying over every little thing; to rephrase negative chatter to positive thinking, and to live from a place of gratitude & love. Fear and worry erodes health and hope leaves room for doubt that things will get better. When we believe in our ability to heal that is when the magic happens! I speak from personal experience on this front. Once you have shifted to a positive mindset the rest is a piece of cake, or should I say “leafy green” … I’m actually a big fan of many of the concepts in a Mediterranean diet, which include healthier fats like olive oil and avocado oil; lots of leafy greens and veggies; anti-inflammatory herbs like oregano, thyme, sage, & rosemary; organic nuts, seeds, and beans; less refined whole grains like sprouted whole wheat, quinoa, amaranth, & millet; wild caught fish from time to time; along with foods rich in polyphenols like organic berries, coffee, green tea, and even a little red wine & dark chocolate as tolerated. I’m not a fan of dairy and feel this, for many, can trigger lots of inflammation. I will occasionally enjoy goat or sheep cheese, but avoid it otherwise. I believe some folks need a little animal protein in their diet and others do better being totally plant based. If you are a “meat” eater try reducing the portion size, keeping it lean, grass-fed, free-range, and making it less often and as a side dish to your veggies. Avoid those overly processed foods, especially those with sugar, bad fats, and yucky chemicals. Foods that sit on that fence of heart healthy or not, like coconut oil, butter, coffee, etc., I’m a big believer in moderation. It’s kind of that 80/20 rule – if 80% of the time you eat/live a heart healthy lifestyle, then the 20% is just part of living all in! Some of my go-to superfoods include fermented vegetables; nut milk yogurts; chia, fax, & hemp seeds; fermented tempeh; green juices and nutrient dense smoothies; ginger & turmeric root in teas or stir-fries, and living foods like sprouts and microgreens. These are all super heart healthy and will support reduced inflammation in the body. What I have consistently witnessed is when folks make these changes and are consistently practicing a heart healthy lifestyle (80% of the time) their doctors begin either reducing or even eliminating blood pressure, cholesterol, and blood sugar medications. As I like to say, LOVE yourself enough to ______ (you fill in the blank)! Janet E. Verney is an Author, Integrative Nutrition Health Coach, Wellness Designer, and Healthy Food Chef who resides in Higganum and loves helping others to “health-up” their lives! Have a burning health or nutrition question, write to Janet at connect@roots2wellness.com. To learn more, visit her website at roots2wellness.com. Whisk the chia seed with the water until it is “egg-like.” Add oil, baking soda, and sea salt and whisk until well blended. With a wooden spoon, stir in the flax meal and then the ground almonds. Mix until dough forms. Place dough between two pieces of parchment paper and roll flat. Slide the dough that is between the parchment paper onto a large cookie sheet. Sprinkle with the spice blend. Bake at 350F for 15-20 minutes, or place in the dehydrator for 24-36 hours, or until crisp. Cut a small triangle at the top of each date half and pinch the lower portion to make the shape of a heart. Place on a cookie sheet lined with wax paper. Spoon about ½ tablespoon of dark chocolate on each heart. Sprinkle with hemp hearts. Set in the refrigerator until set. They make a wonderful holiday or hostess gift. Great to have a batch in the refrigerator for when you just need something a little sweet and chocolaty. So by now you’ve likely seen oodles of ads, Facebook posts, and other promotions to shed those extra pounds. Everyone seems to have a shtick on how to lose weight… via the latest fad diet, a super cleanse, a magic pill, or one heck of a powerful detox. The problem I see with most of these “solutions” to weight loss is that they are usually temporary – the weight comes off and then creeps back on over time. Some like to call this the “yo-yo” effect! To me the answer is quite clear, but for many not always easy. I find that most people know what they need to do, but are still seeking that quick fix. It may take some effort to make some important lifestyle changes, but it is so worth it in the long run. Below I share some of what I have learned through the years in my own health journey and Integrative Nutrition Health education. I broke it into the 9 R’s of managing a healthy weight. I’m not promoting a product or selling a service. I’m sharing what I know to support your journey to better health! Before beginning any changes in your diet or exercise routines, it is best to consult your physician. Before setting out on a path to shed those pounds, it is critical for some to explore their relationship with food. I know there are health coaches out there who specialize in this area of nutrition, so if you have struggled with this, reach out to an expert and get some help or all of your efforts will be for nothing. You may not even realize you have a relationship issue with food. One way to discover this is either working with someone who will ask the right questions, or keeping a food/mood journal. Without changing how you eat, keep a log of what you ate and when, along with how you were feeling before you ate and your mood after eating. You may see a trend that will help you change a stubborn habit or pattern of eating. Don’t go it alone – get some support! The “GUT”, your microbiome, plays a huge role in managing your weight. Think of your gut like a garden. It needs to be well nourished with a balance of good & bad bacteria, along with a healthy level of yeast. Tend to your gut, weeding out the bad stuff and nourishing it with the good stuff, including lots of clean filtered water. When your gut is out of balance, you may not be absorbing nutrients properly, or you may feel overly bloated. Poor digestion can lead to an assortment of health issues and inflammation throughout the body. Not only do we need to feed our gut good food, we may need to restore good gut flora from bad eating habits. Ask your physician about a high quality prebiotic/probiotic. Consider eating more fermented vegetables and reducing pre-packaged foods filled with sugars and unhealthy fats. Be sure to CHEW, CHEW, CHEW – your stomach doesn’t have teeth! Maybe you need a little more help than others and would benefit from a good digestive enzyme or bitters. Bottom line, a healthy gut means a healthy body! Your day to day routines can make or break your efforts to maintaining a healthy weight. It is critical to get a good night’s sleep. When we start our day without a good night’s sleep we tend to reach for garbage food in the morning, which starts a trend for how the day will progress. If you are working full time, or simply have a hectic schedule, planning ahead is key. Set aside a couple of hours, two days a week to plan and prepare some healthy eats or some grab & go snacks. This is especially important for those who travel. If you know there are certain times during the day, or evening that you want to reach for that unhealthy snack, either have a substitute ready to rock, or make a plan at that time to call a friend, take a walk, or do something special just for you. Avoid eating when you are feeling stressed and do your best to eat your meals in a delightful setting, with gratitude. Yes, it’s a bit of work, but YOU ARE WORTH IT! Get your engine running and get moving! Start from where you are and take small steps to get your motor running. I personally love to walk and dance! If getting out and moving is something you have not done in a while, take it slow. Start by walking ten minutes, twice a day and increase each week as you feel comfortable. Don’t go from zero to a five-mile marathon or one of those extreme exercise programs – this is when folks get hurt! If you are unable to walk, then talk to your physician about physical therapy and start with simple movements from sitting or lying in bed. Even good digestion depends on getting yourself moving! So grab a friend and set some time to do it together, keeping you and them accountable to rejuvenate your entire system. I mentioned earlier that you may need some extra support if you are dealing with a stubborn weight issue and although I’m not one for fad diets, there are some wonderful programs out there. Do your homework, ask questions and see if it is right for you. Two bricks and mortar places that I am aware of and feel confident in their approach is Compass Weight Loss in CT and The Hippocrates Health Institute in West Palm Beach FL. My favorite authors who support managing a healthy weight are Donna Gates, Body Ecology; Dr Mark Hyman; Dr. David Katz; and Kris Carr. They are all very different, so explore their websites and see what feels right for you. I always say, no one diet is right for every person, so find what will work for you to reset your system and get you on track to a healthier way of living. This may sound simple, but it can have a great effect on your efforts to lose, or gain weight. Reduce the pre-packaged foods that have all the hidden sugars, unhealthy fats, food dyes and preservatives and replace them with more whole, plant based foods. The more you add in the good, the more you crowd out the bad. Many diets encourage you to reduce your portions of food, or to cut out an entire food group, but if you have a plate filled with whole foods, especially leafy greens and other low starch veggies, you can eat till the cows come home! Take the time to makeover your pantry and fridge and get rid of the junk that may be tempting you and replace it with healthier options. Restock your pantry and fridge with whole foods. When it comes to veggies, I like to get them locally and preferably organic so they are in season and packed with the most nutrients. For grains, I go for the less refined, like brown rice, quinoa, buckwheat, amaranth, and sprouted whole wheat. My go-to fats are cold pressed organic olive oil, avocado oil, organic sesame oil, and on occasion coconut oil. I steer clear of common sweeteners and never eat artificial ones. Instead, I use raw honey, pure maple syrup, coconut palm sugar, and organic stevia in moderation. I keep organic nuts and seeds on hand for a healthy, protein rich snack. I am a big fan of legumes for a high protein, low fat addition to my meals. For those meat eaters, I suggest getting free range, organic options and keeping the portion size super small, making it your “side-dish.” Choose low glycemic fruits like berries & grapefruits and save the moderate and sweeter fruits for treats. Be sure to spice things up! There is no reason for healthy foods to taste bland. Spices have many medicinal qualities and can even improve gut health, so try something new and you may just be surprised. Remember, you are only human, so don’t play the guilt card when you enjoy something not on your plan. It is what you do 80-90% of the time that counts. Having an occasional goodie when you are out and about will not sabotage your hard work, as long as it’s not a daily routine. I love a good cookie, so rather than having a store bought version, I make a batch of my re-designed chocolate chip cookies and freeze them for my go to cookie fix. Feel free to email me at connect@roots2wellness.com if you would like the recipe. Wishing a joyous and healthy New Year! Once you have created your healthy treats, it’s time to think about how to package them. I buy inexpensive glass jars and take-out-boxes for this purpose. I embellish them with fabric, bows, stickers and other assorted fun! Tying cinnamon sticks with twine to the outer packaging makes for a delightful presentation and it smells divine! Most of all, have fun, get creative, and give a gift of love. Lightly toasting the oats with the dried fruits, the maple syrup, and the spices gives the granola such wonderful flavor. I keep the remaining ingredients in their raw state to preserve the nutrients, making this granola one of my favorite superfoods! In a large bowl, whisk the first four ingredients. Toss in the oats and dried fruit and stir until well coated. Spread on a cookie sheet lined with parchment paper. Bake at 350 degrees for about 15 minutes. Stir half way through baking and watch carefully not to burn. In the same large bowl, mix all the raw food ingredients while the oat mix is baking. While still warm, add the oat mix to the raw food mix and stir well. 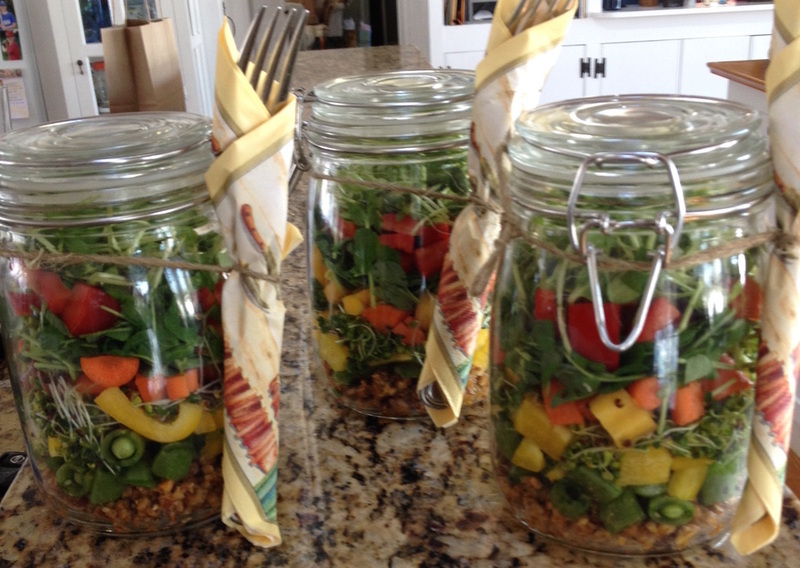 Allow to cool and store in glass Mason jars. Serve with your favorite nut milk or use as a topping to your favorite dairy free ice-cream or yogurt. You can also add crystalized ginger and/or fresh berries or fruit. These are so simple, fun to create, delicious, and make an adorable gift packaged in a little take-out box. Cut the dates in half, making a little cup out of each half. Stuff with almond butter. Melt the dark chocolate and dip the flat end into the chocolate, then dip into a bowl of crushed almonds. Set on a cookie sheet lined with wax paper and place in the fridge until solid. Package into cute take-out-boxes. My one bowl, health’d-up version of this old holiday classic, is not only easy, it is deliciously healthy and allergy friendly. The dough should be stiff. You can roll it in one inch balls, then flatten with the bottom of a glass, or roll it between two sheets of parchment paper to use cookie cutters. Embellish, if desired with raisins, then bake at 350 degrees, on a cookie sheet lined with parchment paper, for 8-9 minutes. Makes about 24 cookies. I adore the flavors of fall, but I don’t like feeling “stuffed” by a meal that is filled with too many carbs and sugars. My favorite aspect of Thanksgiving is being with family and friends, counting my many blessings, and of course watching the Macy’s Day Parade! I like to keep it simple and pre-prepare dishes that I can just throw in the oven the day of the big event. This allows me, as the chief cook (and bottle washer) to spend time visiting with my family and friends. Below are three health’d-up recipes that I love this time of year and that won’t keep you in the kitchen all day. If you are setting the table for a sit down dinner, consider adding a little glass or small jar at each place setting with the guest’s names. Give each person a piece of paper for the number of guests at your event. Encourage them to write something positive about each person and to put it in their jar. It could be as simple as complimenting the sweater they are wearing or something more in depth about how special they are. They can be read outload at the beginning of the meal and shared or kept private. This is a wonderful way to honor the Thanksgiving Feast and each other! In my Recipes ReDesigned below, I have used healthier fats, kept everything gluten free, reduced the sugar content, and made them easy to prepare. Whenever possible, please use organic ingredients! Cauliflower is such a versatile vegetable with so many health benefits. This recipe is a superfood dish that won’t spike your blood sugar and yet is tastes like this old fashioned favorite. This recipe is not for stuffing the bird though, sorry. Gently heat the olive oil and the spices in a sauté pan on med/low. Add the onion and celery and simmer. Stir in the chopped cauliflower and toss on med/high heat until slightly brown and tender. You may need to add a small amount of water to help steam the cauliflower. Check for taste and add more seasoning as desired. Turn into an olive oil greased, oven proof dish. Cool, then cover and place in fridge until ready to serve. When ready to serve, leave at room temp for 1 hour, then bake at 350 for 30 minutes. Special Note of Recognition: Cauliflower is a member of the cruciferous vegetable family, which is known for its cancer fighting properties. It is a terrific anti-inflammatory and is full of antioxidants. It is rich in vitamins, supports digestion, and is a natural detoxifier to the body! Another powerhouse food that often gets criminalized with heavy fats and way too much sugar. 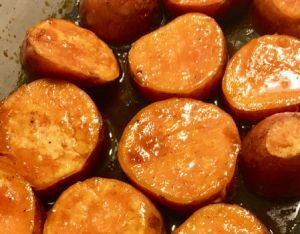 Here is my favorite go to sweet potato recipe that keeps it simple and relatively healthy! 1 Tbs. of orange liquor or fresh orange juice. Wisk all of the above ingredients, except the sweet potatoes, in a shallow casserole dish and spread it evenly in the pan. Remove the tips at both ends of the sweet potatoes. Keeping the skins on, wash and cut the sweet potatoes into one inch round disks. Dip one side into the mixture, then turn over to coat the other side. Cover and place in fridge until ready to serve. When ready to serve, leave at room temp for 1 hour, then bake at 400 for 40-50 minutes, or until tender, turning once half way through baking. 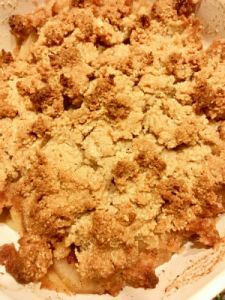 I grew up in a Pennsylvania Dutch home where apple pie was often served for dinner… I even ate it for breakfast with warm milk and a teaspoon of sugar! I still love this fall favorite, but the gluten and all the refined sugar just trigger inflammation for me, so here is one of my easy, go to recipes to get my apple fix. Preheat oven to 350 degrees. For the filling, whisk all ingredients in a large bowl, except the apples. Add the fruit and toss to coat. Pour into a 9” baking pan. For the topping, using the same large bowl, whisk all the liquid ingredients, adding the spices and salt. Add in the almond flour and mix in with a fork until chunky bits form. Crumble it over the fruit mixture. Cover with parchment paper, bake for 30 minutes, remove parchment and bake for 10-15 minutes, or until bubbly and brown. By now I’m sure you have heard the term Gluten-Free (GF), but what does this mean and is it right for you? So what is gluten and who should avoid it? Gluten is a protein found in many grains, prepackaged foods and in many beauty products. For someone with Celiac disease, an autoimmune disorder, gluten can be lethal and must be completely avoided. I have friends with this challenging disease who cannot even use pots and pans that have been exposed to gluten, even after washing. Although I do not have Celiac disease I personally follow a GF lifestyle. Some folks are sensitive to this gluten protein and if they have any underlying inflammation in the body, gluten can be one of the culprits. It is especially aggravating for those with digestive issues and joint inflammation. If you don’t have Celiac disease, but are struggling with inflammation and/or digestive issues, you may want to try going GF, but first I would suggest looking at avoiding overly refined flours and sugars. I find it quite interesting that friends who cannot tolerate breads and pastries in the US, go to Europe and eat the breads and pastries without any upset. This furthers my belief that it may not be just the gluten, but the overly processed grains here in America. I encourage my clients to eat 100% whole and/or sprouted grains, the less processed the better. To take it a step further, I ask them to try some of the ancient grains like quinoa, millet, amaranth, and buckwheat, which are all gluten free. Technically they are all seeds, not grains, but in most recipes they are used like you would a grain. You may want to try using one of these in your favorite rice dishes as a substitute. Yes, rice is GF, but it is a more starchy carbohydrate that will raise blood sugar and has been known for having traces of arsenic. A word of caution when considering a GF lifestyle… don’t fall victim to all the overly, ultra-processed GF foods on the shelves of the supermarket. It is simply junk food in another form! Here is an example of a GF cookie, with the first ingredient being “SUGAR,” which all experts agree is the number one culprit for the deterioration of health in our culture. My next article will be about the sugar blues… stay tuned! When it comes to reading labels on pre-packed foods, also consider the ingredients you cannot pronounce or if you do not know what it is – these are best to avoid and are typically preservatives or emulsifiers that can wreak havoc on your digestive system. So let’s look at some great GF alternative flours. My two favorite, go-to for replacements are garbanzo bean, also known as besan flour in Asian markets, and organic almond flour. Local grocers carry the garbanzo bean and I get my organic almond flour from nuts.com. I create an assortment of baked goods with these flours and also use them to “bread” veggies and meats to bake. Below are two of my all-star recipes. Keep in mind that some folks have allergies to nuts so it is important to share with your guests that you have used a substitute to prevent anyone from consuming something they may be allergic to. Stir in 3 cups chickpea flour until just blended. Scoop by spoonfuls and press flat onto cookie sheet lined with parchment paper, bake at 325F for 8-10 minutes. Best kept refrigerated or frozen (place on a cookie sheet and set in fridge until chips are solid, then place in container for storing). Whisk the chia seed with the water until it is “egg-like”. Add oil, baking soda, and sea salt and whisk until well blended. With a wooden spoon, stir in the flax meal and then the ground almonds. Mix until dough forms. Photos of food by Janet. Photo of Janet by Studio Petronella. As seen on Haddam News Online. ‘Tis the season for this wonderful veggie, but if you’re like me and have a garden full of it, it can be a challenge to reinvent it into another culinary creation! I have to say that the many health benefits of this abundant vegetable make it worth the trouble. It is low in calories, has a high water content that is great for staying hydrated in the heat of the summer, and it has a good deal of vitamin C to help reduce inflammation and keep you healthy! When possible, buy organic or locally grown and keep the skins on – they are full of beta-carotene, which converts to vitamin A when consumed, keeping your eyes healthy and bright! In addition to the skin, be sure to try the zucchini blossoms as well, which also have their fair share of beta carotene. Zucchini has to be one of the most versatile vegetables with its unassuming flavor, taking on the seasonings of your choice. Let’s explore a few ways to prepare this garden favorite. I like a simple grilled zucchini. I slice it and then place it into a grilling basket, lined with parchment paper. I drizzle it with olive oil, add a sprig of fresh rosemary (dried is fine too), a sprinkle of sea salt and then grill to the desired consistency (about 15 minutes). 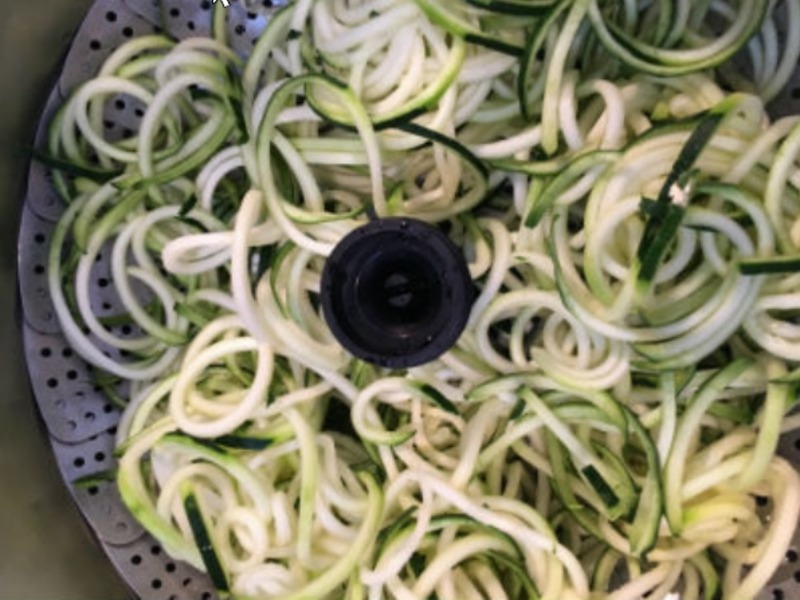 My favorite has to be spiralized zucchini, which creates long strands that are very much like pasta. The zucchini noodles can be eaten raw, or lightly steamed and served with your favorite sauce. I make my own crockpotted marina with tomatoes and herbs from my garden. If you don’t have a spiralizer, you can find them online for under $25. It is fun to do and kids just love to help! Zucchini boats are a great option for the ones that hid in the garden and look more like a giant club. I cut them in half, the long way and scape out the overly large seeds. I bake them skin side up on a cookie sheet with a small amount of water until they are easily fork tender (about 30 minutes at 350) I make a quinoa/lentil (high protein) mix with some chili flavoring or a ginger gluten-free soy sauce mix and then stuff the zucchini boats. These can be made ahead and then re-heated with a drizzle of olive oil, a bit of crumbled cashew cheese (cashews ground with sea salt and a bit of garlic), or with your favorite asiago or parmesan cheese. Make the most of this abundant veggie and enjoy all the wonderful health benefits! You may even consider the famous zucchini bread, but that’s for another day. Herbs & Olive Oil are Good for the Gut! Did you know that Herbs & Olive Oil are a win win for your GUT? In this picture, I have fresh rosemary, sage, oregano, and thyme in a glass jar with some organic, extra virgin olive oil. Rosemary supports poor digestion of fats and has some prebiotic properties. Sage can reduce bloating and abdominal spasms. In olive oil it can help lower blood sugars. Oregano is a powerful antioxidant, is anti-microbial and promotes healthy gut bacteria. Thyme mixed with olive oil is superior for gut health. Olive oil is a polyphenol that is known for its anti-inflammatory properties and is believed to help lower LDL, bad cholesterol. 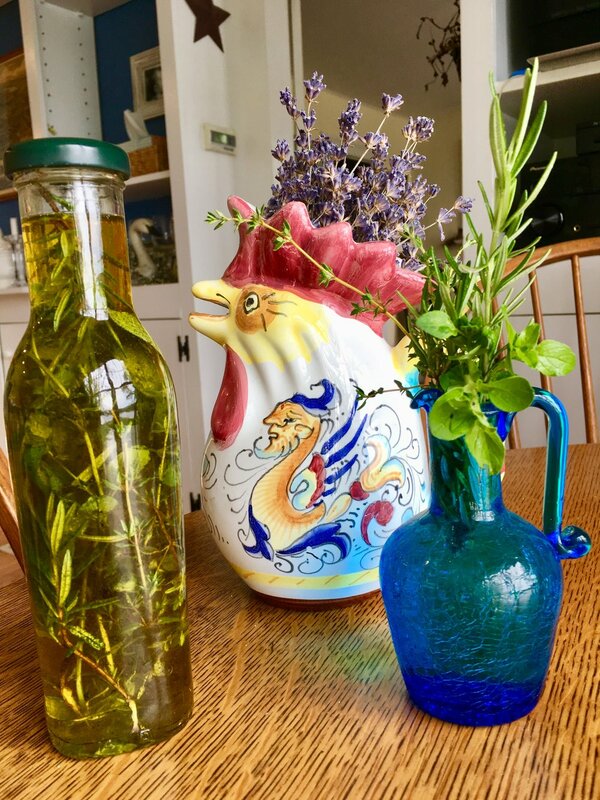 So get some high quality organic olive oil and some fresh herbs and make your own wonderful infused oil for use on salads of all kinds, or over some GF Ancient Harvest pasta with lightly sautéed veggies. I have heard so many debates on this and continue to hear much confusion about this topic, so here are my two cents for your consideration. First, I believe they both have their benefits, when done right! When done wrong, they can really mess with your health. I have even heard some “smoothier’s” say they are juicing because they make their smoothie less thick and more watery…. Um, no…. that isn’t juicing folks. Ok, let’s start with JUICING! Juicing is not blending, it requires a juicing machine (I’m partial to my Omega J8006 – easy to use and easy clean-up). My first rule is to only use organic produce. My second rule is only juice low glycemic veggies, no fruit. When we juice we are removing the FIBER from the produce. When we remove the fiber we speed up the absorption of nutrients, which is like liquid gold to our cells when we only use the green stuff, of course. When you juice fruit it is like overdosing on sugar, spiking your blood sugars. You see, fiber slows down the sugar spike of fruit. Juicing may take a little more time, but in my humble opinion, it is one of the key ingredients to improving your health. 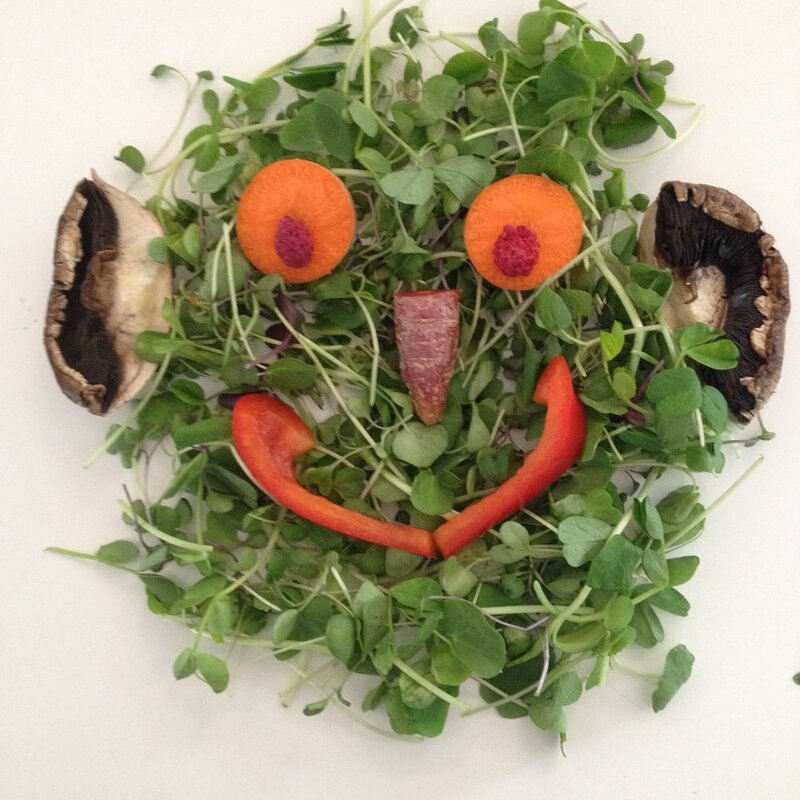 My go to recipe is one cup of peashoots (a living raw food, high in protein), one cup of sunflower shoots (a living raw food, high in protein), one cucumber (super hydrating), and five celery stalks (a superfood in its own right, decreasing inflammation in joints, soothing gut issues, and supporting lunch function). Sometimes I add lemon or ginger root (great anti-inflammatory and adds heat to your digestive fire). For newbies to juicing, adding ½ a green apple (no seeds) may make it more palatable. To me, my green juice says “I LOVE YOU!”. Now we are on to SMOOTHIES! When we blend organic produce, including fruit, it maintains the fiber, slowing down the glycemic spike to your blood sugar and it is a great way to get some high quality nutrition in a single serving. Having said all that it is important to choose your ingredients wisely. This is not an opportunity to throw in a scoop of ice-cream or other junk foods. I encourage low glycemic fruits, like berries to get you started. My favorite go to blender is a Vita Mix, but they are expensive, unless you find a reconditioned one online. There are many mini blenders out there now that work pretty well for this purpose. Smoothies can be healthy, but they do pack a lot of calories, so it’s best to make them a replacement for a meal when you are short on time. My favorite go to recipe is a cup of wild frozen blueberries, ½ of an avocado, one pitted date, a handful of greens (I like to mix them up, but my favorites are spinach & kale), a tablespoon of chia or hemp seeds, and organic almond milk to blend. This is packed with protein from the greens, the seeds, and the avocado! No need for those expensive, overly processed protein powders. If you do invest in protein powder, I suggest organic, vegan, and raw – my two favorites are Sunwarrior and Garden of Life, but be sure to read the labels and get only those sweetened with stevia and no other sugars! One more thought while I have you on this subject… A common mistake folks make when consuming their smoothie or juice is to GULP it down… No, no, no, not a good thing! Did you know that your gut is responsible for 90% of disease? 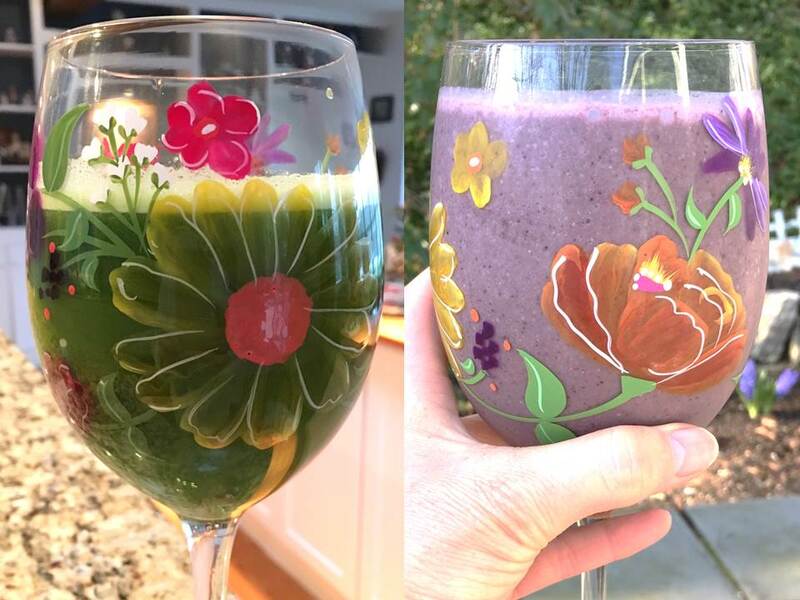 Ok, that’s a whole new topic, but for the sake of your gut, it is super important to swish or chew your juice and/or smoothie to stimulate those critical digestive enzymes in the mouth. 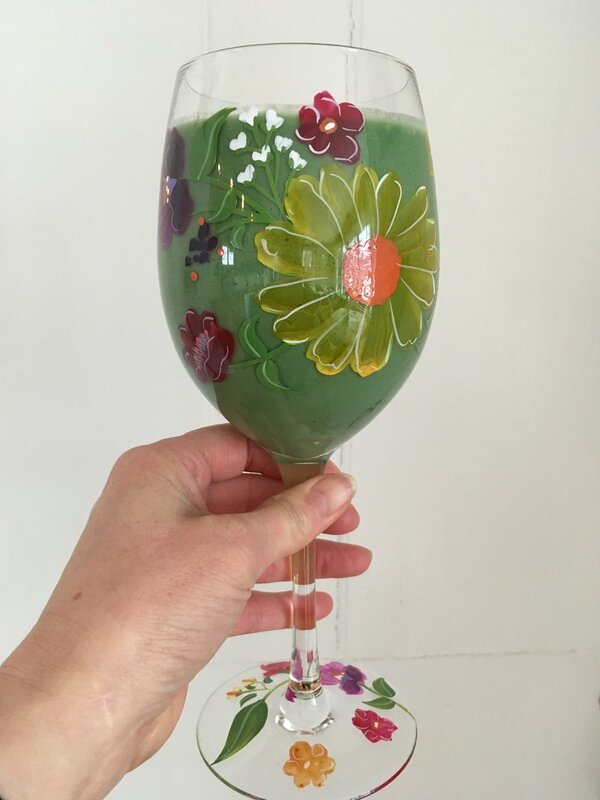 I’ve had clients tell me that they often feel bloated after consuming a smoothie and when they make an effort to chew their smoothie that greatly improves. I hope this helped to clarify juicing versus smoothies and how they can both play a role in your health. Please feel free to ask any questions you may have on this highly debated topic. For those enrolled in our foodGEVITY.com program, we have demos and recipes as well for both juices and smoothies. Do you have that "feel good factor"? The one without fatigue, aches & pains, and lack of energy? What's your body telling you? Your body is constantly talking to you, letting you know when it's out of balance or lacking harmony! Feed your body clean food, decrease your stress levels, move your body, and practice daily self-care - this is a great start to quiet an inflamed body and begin your road to health! Join me at foodGEVITY.com and let's get started! Green apple if you want a little sweetness to your juice. To kick your digestive juices into high gear, be sure to "chew" your juice!